For expertly crafted solid wood interior doors, we work with Good's Millwork. Their solid handcrafted hardwood doors are constructed to bring out the beauty of your home. 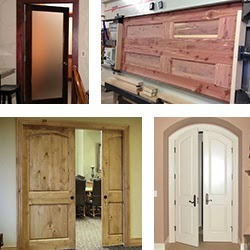 Good's Millwork offers many popular styles of doors, many available for quick ship, and can create any custom style you can dream of. They also offer several choices in wood including Red Oak, Knotty Pine, Knotty Alder, Poplar/MDF and Radiata Pine. Popular with many of our customers, Good's Millwork also offers Solid Eastern "Virginia" Cedar -- a beautiful wood that turns a rich red once finished. This aromatic cedar (shown right) naturally detracts fiber-eating insects such as moths and silverfish and is a very close match to Bermuda Cedar, which is now protected and no longer available. Please contact us for a complimentary consultation to get your new door project started today!